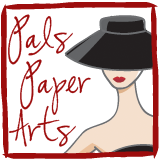 I hope you are ready to play this week at Pals Paper Arts Challenge! Tomorrow is the full reveal of the peek above. Can you guess what the theme is? This is going to be cute! I can tell!